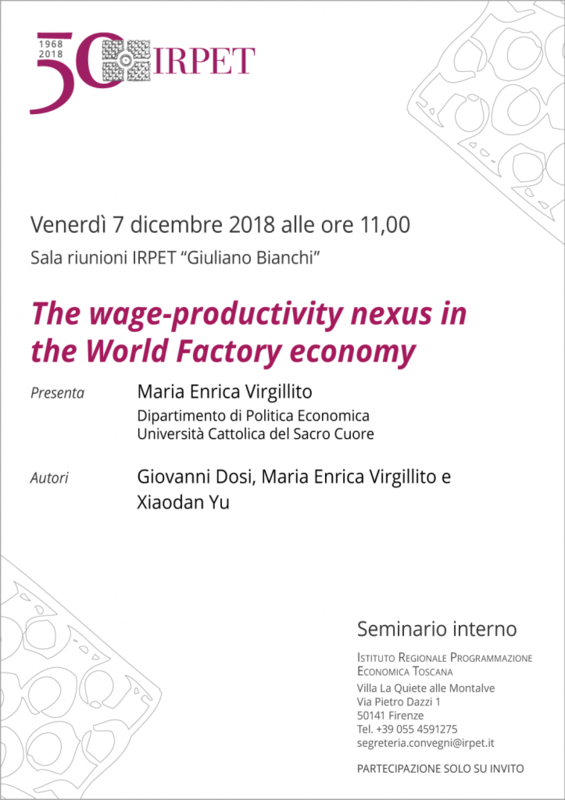 Venerdì 7 dicembre, presso la Sala Bianchi dell’IRPET a Firenze, via Pietro Dazzi 1, si terrà il seminario interno “The wage-productivity nexus in the World Factory economy” con Giovanni Dosi, Maria Enrica Virgillito e Xiaodan Yu. Presenta Maria Enrica Virgillito, Dipartimento di Politica Economica, Università Cattolica del Sacro Cuore. This paper presents new findings on the wage-productivity nexus in the world factory economy. After presenting the long-run macro-elasticity characterizing the phase of Chinese economic development since the Eighties, we look at the wage-productivity nexus from a micro level perspective using a detailed firm-level datasets covering the period of ownership restructuring (1998-2007). We observe a convergence process in both wage and productivity dispersions driven by the shrinking lower-tail of the distribution. Next, we investigate the link between wage level/growth and productivity level/growth using a quantile regression methods. First, we find a positive and monotonic increasing association between productivity level and wage level on the quantiles of the conditional wage distribution. The latter relationship is primarily driven by private owned enterprises, while State-owned ones display a remarkably different pattern contributing significantly to the convergence of wage distribution. Second, what is remarkable are the low coefficients of elasticities which are always below 0.3, and often in the neighborhood of 0.1. That is to say, most of the fruits of the impressive technological catching-up have not been passed through wages. Interestingly, such elasticities vary across the quantiles of the productivity distributions, according to a U-shaped relation, with the lowest and highest productivity quantiles having relatively higher pass-trough rates. Indeed, it is such property of the lowest quantiles which mainly accounts for shrinking wage dispersions.